I came across this on Ebay I did not link the sale as the auction is still ongoing, The reason I did this is for a bit of info people may not be a wear of. All my Auctions start at $0.01. Please Visit & Follow my Site/Store. Need more time to pay or Bidding/Watching on more items - No Problem - just contact me. I Accept PayPal Only. Ship Fast & Safe. Returns Accepted. Buyer Pays for Return Shipping - No Exceptions! Combined Shipping. International - Ebay Global Shipping Program. Please View All Pics and Read Full Description. NO REPROS - EVER! All of my weapons and accessories are Authentic! Float/Drop Tested and Cross Referenced with the Imperial Gunnery Website! 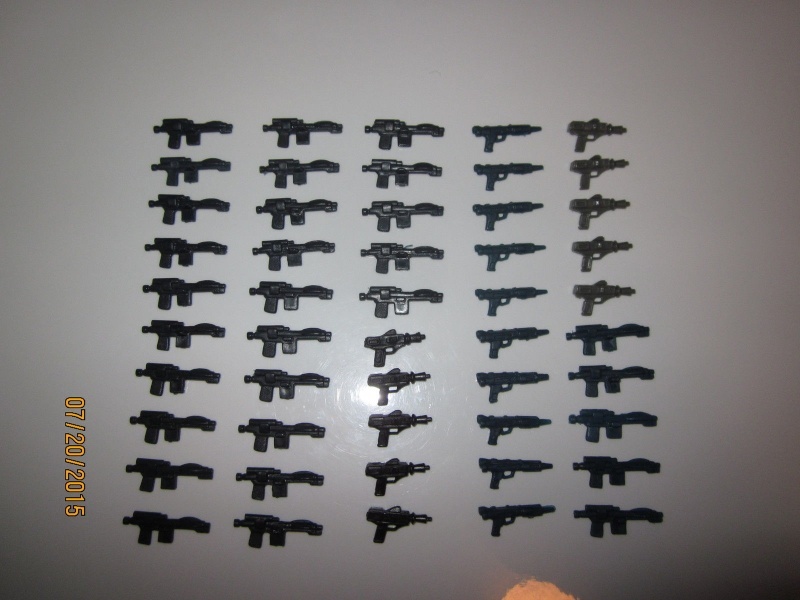 WEAPONS LOT: 50 Pieces - All Blasters. Vast Majority Excellent through Excellent/Near Mint, the rest Good - very minor blemishes/scuffs. No Broken or Missing parts. I am guessing when some of you (mainly the younger crowd) see this type of thing you wonder how could you have so many weapons and where did you get them at. The truth is when the figures first started coming out in the 70's and onward if you lost a weapon or whatever you would send Kenner a request for a replacement one, Now here is where you see where all these weapons come from , Kenner had made thousands of weapons (mass production) so when they got a request for one it was common practice to just bag up a bunch of weapons and send them to the person, I personally needed a Han Solo one so I contacted Kenner I got my Solo One along with like 70 or so other ones a varying types. but I was a kid so they were just lost or given away lol. So people who were older and thought maybe these would be worth something as the popularity of the Star Wars phenomenon grew would send Kenner request for weapons and bingo lots of star wars original weapons ar in the market to be bought. This is a thing that still happens with figure line, Plastic model companies etc If you need something just send a request and they will send you a replacement free of charge. Larry, I think what your talking about with kenner was there "we really do care" campaign. I have seen and heard of huge amounts of things that were bunched up together and sent. I don't think this many of one type though is all from one request. Most of the ones I have seen and or heard about where like a mix of all sorts so it was more diverse/mixed up than this. true but it's the idea around how many were sent for the ones I got there were like 10 solo guns a few trooper one etc not that you would get 50 trooper ones but if you sent in request over say a few years you could end up with a fair amount of spares hence the amount of vintage weapons for sale not only on ebay but other sites. That is a good point Larry. I think sometimes the production numbers are not thought about. We don't know how many hundreds of thousands or maybe millions of these figures were made. If you have ever seen the molds trees there are a lot of weapons per casting as opposed to the figure molds (assuming they are the same as the uzay molds) where there is only a cavity for one figure at a time. So shooting plastic into both molds at the same time you get one figure to eight, ten, or more weapons. I am sure with kenners really do care program of sending out replacements by the handful, they had way more weapons produced than figures. I was looking at Bluesnagman's repro shite the other day and it occurred to me just looking at recent sales that this seller alone has been responsible for unleashing thousands of repro weapons onto the market. Add this to all the other sellers of repro and that's a depressing number you might come up with. But then when you consider how many originals Kenner issued with their figures - 300 Million according to Wikipedia - not to mention all those weapons bundled up in mailers, inside AT-AT boxes, and the replacements given out in the mail - that imagined number of repro is still a piss in the ocean isn't it? So then you wonder why they even made repros at all when at anytime you could and still can pick up originals easily and cheaply (there are a few rarer and more expensive exceptions we know). A mixture of laziness, ignorance, greed, intention to scam, and some collectors not caring if they have fakes are the obvious answers. Larry, I didn't know that Kenner would send so many weapons out like that when you sent in for a replacement Their 'We Really Do care' policy was such a nice touch, not really seen since from a toy company I don't think? Bluesnagman's does have a lot of repos it's good if you are doing customs drill a hole in them or alter the weapon like I do. I have bought the GI Joe bulk ones from sellers possibly him as well. The idea of sending replacement parts is always a good idea I am not sure what other toy companies do this, The only other time I seen it was with plastic models if you were missing a part or it broke or what ever the reason you could contact the company and get a replacement but they would just send the part or decal sheet not a bunch of parts, still it's a good business practice as who would want to have a missing or broken part on something you work so hard to look good. I have been building models before SW was even on the drawing board and the companies did it back then as well as continue today. I still wish I were smarter and kept all those extra weapons or ordered more through out the ages lol. I've been wondering how someone could have so many weapons, and I've questioned the validity of their auctions.